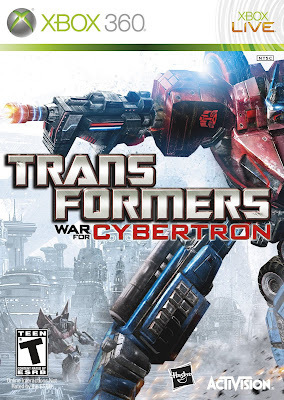 Synopsis: Is War for Cybertron a movie game, or do we finally have a Transformers game that has absolutely nothing to do with anything Shia Labeouf has had his hands on? 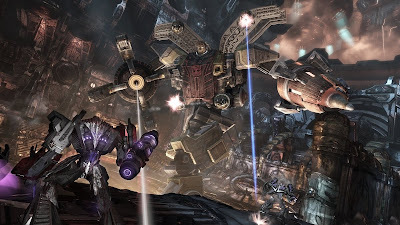 Moving on, we have received our review copy of Transformers: War for Cybertron, and after repeatedly being disappointed by the previously released Transformers titles, I am happy to review Activision’s recent iteration in hopes of a fun game. 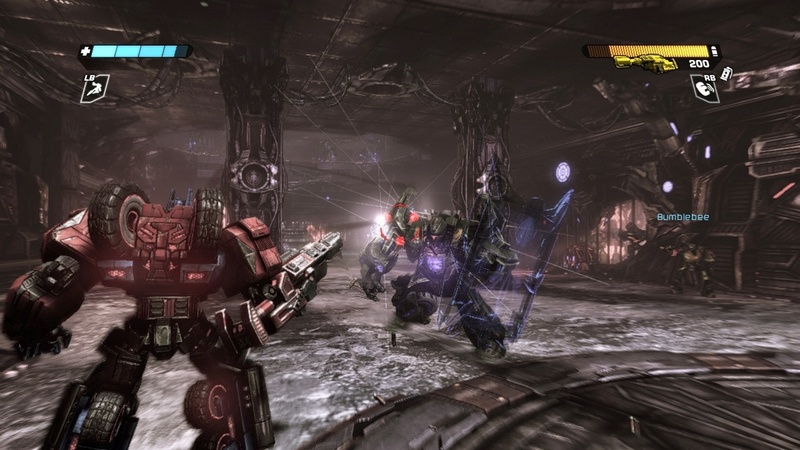 As you start the game you choose your side in the battle between Optimus and Megatron on Cybertron before the epic fight is brought to earth. 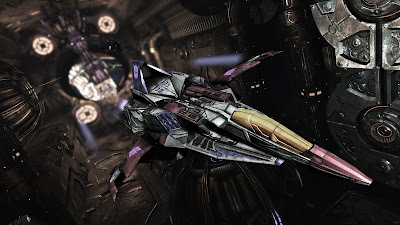 Each side of the battle has five campaigns and three transformers to choose from between each campaign and though there are individual campaigns for each side, each are intertwined in some form or another. 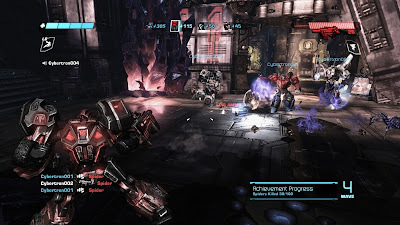 This third person shooter is more than a single player fight from the perspective of hero or villain, you can also fight in three player online coop, and there are always the competitive head to head multiplayer matches. Praise: It is not based on a Transformers movie and for that alone, I like it! 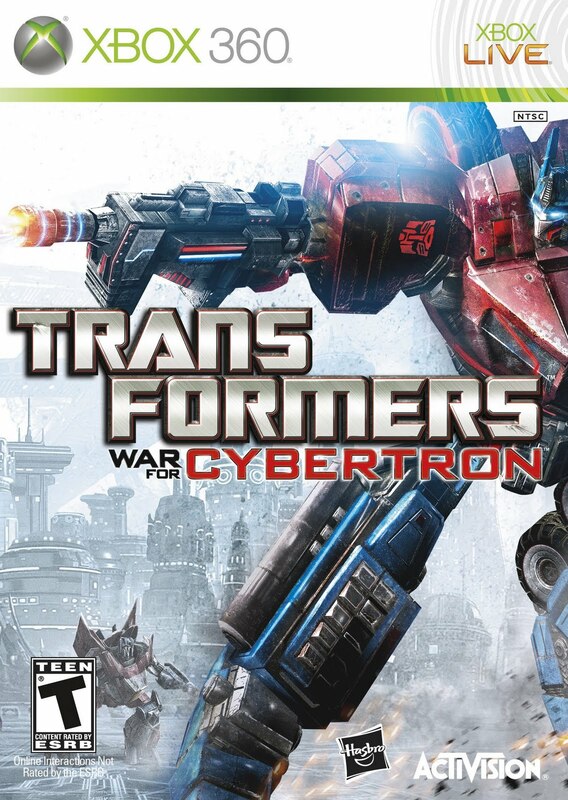 I wish I could say I am kidding but the last movie game that I actually enjoyed was Wolverine, so back to War for Cybertron. The controls were more complex, simply because you can switch into the vehicle mode at anytime, but it doesn’t take long to get used to, because the controls are relatively similar to the Call of Duty games. The story is engaging from the start regardless to which side you choose, of course my dark side had me start as Megatron out to capture dark energon and gain control, but when I played as Bumble Bee, because I cannot bring myself to play as Optimus; you start your campaign with a different view of how the battle started. 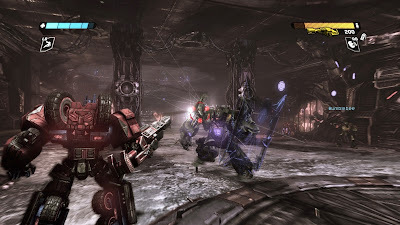 The environments are dark and massive, while still giving you the feeling that your Transformer is this massive force to be reckoned with, while the lighting is dark, it is easy to make out the enemy as the Autobots have red accent lighting to them and Decepticons have purple accentuations to them. Coop gameplay is seamless as you do not have to wait for teammates to join before starting and if they drop out, you do not have to start the mission over again, while having up to two teammates, makes the gameplay entertaining. Gripes: I have spent a couple hours online, and was unable to get into the multiplayer the same way I previously got hooked on Blur or Modern Warfare’s multiplayer gameplay. It has the same online system where you level up and can make your transformer unique after leveling up with weapons, perks, and abilities, but the only difference I feel between this and Call of Duty, is that it is a third person shooter and the maps seem to be significantly smaller. Trying to make your way from waypoint to waypoint through the missions had been frustrating at times due to the locations of your objectives being unclear as to where you need to go. Lastly, the collision mechanics seem to have a couple bugs as there were numerous times where I would jump or double jump onto a platform and wouldn’t be able to get to the desired point without moving over to the left or right some and trying again. As a fan of Transformers, the toys and the cartoons, not the movies, I enjoyed my time spent with this title. After trying hard to enjoy the previous releases, Activision did this right, and I am happy that I never gave up on the games as there is fun to be had and it was worth the wait. From the classic characters to the gameplay whether single player, coop, or online multiplayer, there is a lot of replay value. 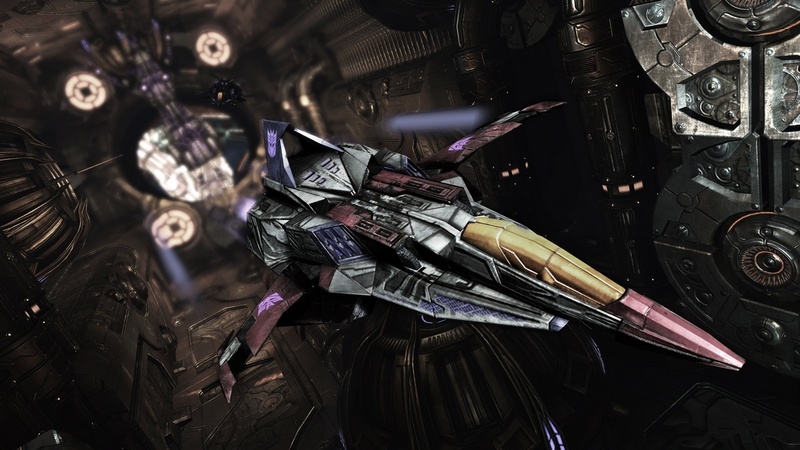 Mashbuttons.com gives Transformers: War for Cybertron a more than meets the eye 9 out of 10. Transformers: War for Cybertron is available now for the Xbox 360, PC, and PlayStation 3.